Former Vice President Joe Biden gave an emotional speech during a memorial service for Sen. John McCain at North Phoenix Baptist Church on Thursday. Sen. John McCain may have been on the opposite side of the political aisle from Joe Biden, but the former Democratic vice president delivered an emotional eulogy for his late peer Thursday, saying, "I always thought of John as a brother." "The way things have changed so much in America, (some people) look at him as if John came from another age," Biden told the estimated crowd of 3,500 that packed North Phoenix Baptist Church. "That he lived by a different code, an ancient, antiquated code where honor, courage, character, integrity, duty mattered. "Because it was obvious that was how John lived his life. But the truth is John's code was ageless, is ageless." At one point in the eulogy, Biden, 75, addressed the brain cancer that ended McCain's life at the age of 81 last weekend — a disease that also claimed the lives of Biden's son Beau and Sen. Ted Kennedy. 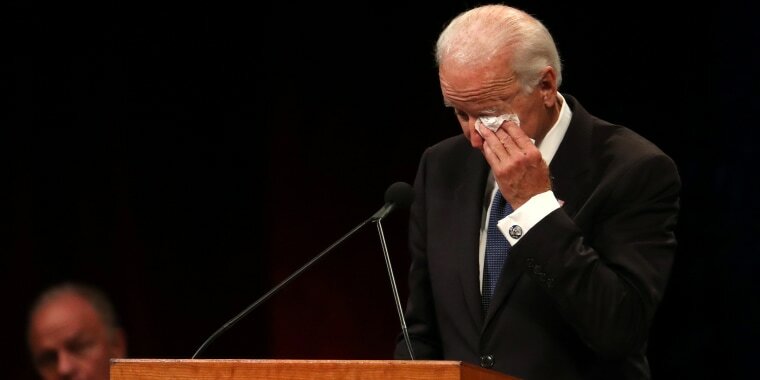 "The disease that took John's life, took our mutual friend (Ted Kennedy's) life ... and three years ago took my beautiful son Beau's life, it's brutal, it's relentless, it's unforgiving," said Biden. "It takes so much from those we love — and from the families who love them — that in order to survive we have to remember how they lived, not how they died." A Vietnam War hero who survived five years of torture as a prisoner of war, McCain served as an Arizona congressman and senator for more than three decades. He ran for president twice, becoming the GOP nominee against Barack Obama in 2008. Such was the dignity he brought to office that his two main rivals in his presidential runs, Obama and George W. Bush, will deliver eulogies during a private memorial service at Washington National Cathedral on Saturday. McCain's body was being flown from Arizona to Washington for a viewing Friday at the U.S. Capitol. A day after Saturday’s service, McCain will be buried at the U.S. Naval Academy. On Wednesday, McCain was honored in a private memorial service held at the Arizona State Capitol for family and friends. Cameras captured the moving scene as wife Cindy McCain kissed her husband's casket. His daughter Meghan McCain broke down in tears as she stood by the coffin.